I tried to explain to my friend Len Edgerly last week just how much I enjoyed playing games on the Kindle. It’s fun to do something digital on a screen that isn’t backlit — and I always enjoy spending time with my Kindle. And it turns out that two weeks ago, Amazon released a brand new word game for the Kindle — for free. It’s one of several new games that are available for the Kindle — and most of them cost just 99 cents. 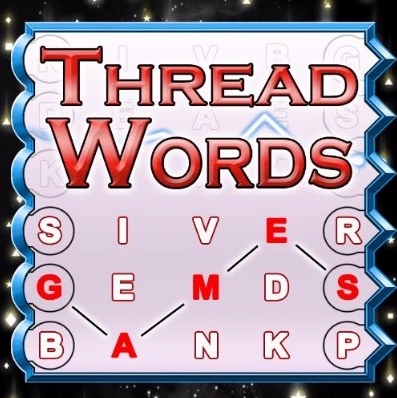 Amazon’s new free game is called “Thread Words”, and it’s sort of a cross between “Every Word” and “Boggle”. (There’s 25 letters in a 5 x 5 grid, and your goal is to create words by using one letter from each column, while only moving up and down by one row.) This marks the eighth free game that Amazon has released. (They’d released their slick version of “Dots and Boxes” just three weeks earlier, plus their own version of the classic number-grid game “Number Slide” on March 31.) I’d describe their latest game as “horizontal Boggle,” since you’re trying to form as many words as possible while still reading from left to right. But on the same day, a new game company was releasing their very first game for the Kindle. Olmatech Technology has put together a nice version of the classic board game “Chutes and Ladders,” where players take shortcuts through a 100-square board — either traveling up on a ladder, or sliding backwards instead! Surprisingly, the game dates back to ancient India, according to Wikipedia, where its original name was “the ladder to salvation.” (It taught the concept that good deeds are rewarded while bad deeds are punished.) In the Kindle version, there’s a tiny little “Kindle” icon that represents your opponent — and if it slides backwards on the back of a snake, a cute little animation plays in the game’s lower right-hand corner! 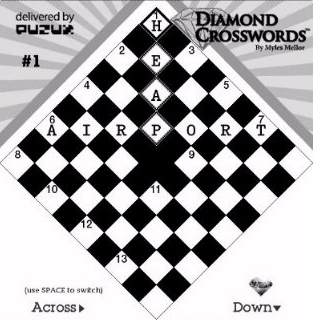 There’s also a new kind of crossword puzzle that’s been released by Puzux games. 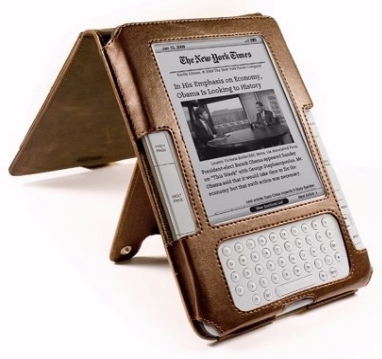 (They’re the company that first brought to the Kindle those Jumble puzzles that you’d see in your Sunday newspaper.) 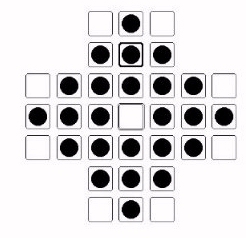 In a mind-boggling twist, the grid is rotated 45 degrees, so the “across” words are formed using squares that only touch at their corners, in what would be a diagonal line in a conventional crossword puzzle. Their game is called Diamond Crossword, of course, and though there’s fewer words than a traditional crossword puzzle, this also means that it won’t take you forever to finally finish a grid! that’s finally reached the Kindle. (“Did you know…” the game asks at the bottom of one screen, “the first evidence of the peg solitaire game can be traced back to the court of Louis XIV in the year of 1697.”) I enjoy trying to think out my moves in advance — and even after I’ve solved one of the puzzles, I still get a special thrill if I can solve them again.